Second California real estate tax payment is due April 10. California doesnâ€™t accept federal SE tax deduction amount. S corporation dividends reclassified as wages. MidPeninsula Media Center broadcasts Financial Insider Weekly. 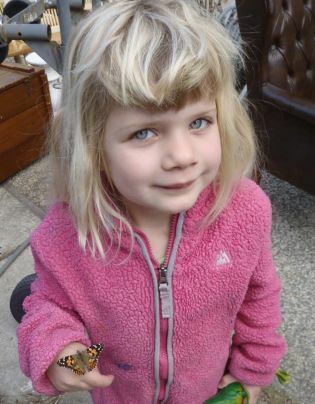 My granddaughter, Kara Siemer, and Grandma Janet raised this butterfly from an egg as a science project. For a day, the world becomes Irish! St. Patrickâ€™s Day is Saturday, March 17 this year. St. Patrick was a Scottish missionary to Ireland who preached Christianity. He used a three-leaf clover as an analogy of the Holy Trinity. Today, St. Patrickâ€™s Day is a celebration of everything Irish. The Roman Catholics traditionally wear green on St. Patrickâ€™s Day, and the Protestants traditionally wear orange. Since so many Roman Catholic Irish immigrated to the United States, we have mostly adopted green. If you donâ€™t wear green, you are traditionally a target to be pinched! Have a grand holiday, and may the luck of the Irish be with you! My brothers in law, Wade Allison and Lane Johnston, and my sister Arlene Gray-McLean, are celebrating birthdays during March. Happy Birthdays! There are only about a month and a half before the tax return due date. If we prepared your income tax returns last year, you should have already received instructions in the mail. If you havenâ€™t, please call Dawn Siemer at 408-918-3162. Our goal is to have every individual income tax return for which we have received complete information by March 15 completed by the April 17 due date. Any tax returns for which we receive information after March 15 will probably be on extension. To have us prepare your income tax returns, start with the online Tax Notebook organizer. Call Dawn Siemer at 408-918-3162 for instructions to get started. We also have a paper organizer, if you prefer. We still need your documents (W-2s, 1099s, property tax bills, auto registration bills, receipts for donations) to prepare your income tax returns. The due date for 2011 calendar year corporate income tax returns, including for S corporations, is March 15. Although many corporations will apply to extend the due date for their income tax returns, there is no extension for paying the tax. That means they need to have a pretty good estimate of what their income is before that due date. Now is the time to get those extension computations in process with your tax return preparer. There is a nasty penalty for late payment, and the due date is weird. The IRS wonâ€™t be requesting a separate disclosure of revenues received from merchant account (credit card) transactions and payment services like Pay Pal on business income tax returns, after all. The Franchise Tax Board has announced that the federal amount for self-employment tax isnâ€™t acceptable for California tax reporting. The IRS changed the deduction amount to 59.6% of the social security portion of the self-employment tax because of the 2% reduction of â€œemployeeâ€� social security tax for 2011 and 2012. California still limits the deduction to 50% of the self-employment tax. If you are subject to self-employment tax, be sure to download the latest version of your tax return preparation software. You shouldnâ€™t submit the tax return until you see an adjustment for the self-employment tax deduction on Schedule CA. This could delay processing for many taxpayers. The Franchise Tax Board just issued an announcement that taxpayers who already filed their income tax returns without a California adjustment for the self employment tax deduction should not file an amended income tax return to fix it. The Franchise Tax Board will send a letter with a proposed adjustment for this item. This late announcement will make many taxpayers and tax return preparers very grumpy this year. Just in case youâ€™ve been in a cave for the last month, the 2% reduction in employee social security tax from 6.2% to 4.2% has been extended for the rest of 2012. Be sure to update your payroll processing software, if applicable. The IRS has issued a reminder that the last day to file a late income tax return for 2008 and receive a refund is April 17, 2012. After that date, the refund is forfeited. The Eighth Circuit Court of Appeals has upheld a federal district court decision ruling that a portion of dividends paid to an S corporation shareholder should be taxed as wages, subject to employment taxes. In this case, the S corporation shareholder was a CPA working for his own professional corporation! He received $24,000 as wages and dividends of $203,000 for 2002 and $175,000 for 2003. The court agreed with the IRS determination that reasonable compensation would be $91,000. The good news for the taxpayer? He apparently still received about $136,000 for 2002 and $108,000 for 2003 without being subject to employment taxes on that amount. The bad news? He probably paid more than his tax savings in legal fees! We have added another public access station to the group broadcasting my weekly show. Itâ€™s Midpeninsula Media Center, Comcast Channel 28 in Palo Alto, East Palo Alto, Stanford, Menlo Park & Atherton. The show is broadcast on Saturdays at 9 a.m. and 6 p.m.